The new First Utility Super League season is now underway, an apt time to reflect on the positive experience of a successful partnership. 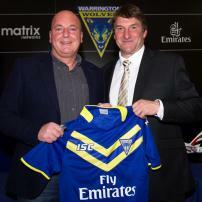 Pictured left to right, Mark Thomas Cortech Director is presented with the new 2014 Wolves home shirt by Warrington Wolves Head of Coaching and Rugby Tony Smith at the club’s official Season Launch Dinner last month. Last season Cortech confirmed a three-year extension to the sponsorship deal of Tony Smith. “We are all really looking forward to the new season and remain grateful to Cortech for their continued support. Once again we look forward to strengthening our association moving forward” said Tony. Cortech were proud to present last season’s rugby shirt to a local school which raised £100 towards better equipping their facilities. “We look forward to donating this year’s shirt to another school, allowing them the opportunity to raise much needed funds’’ said Mark.